High-octane and compulsive viewing, it's little wonder NASCAR is one of the most popular sports in the USA. While the majority of races and fans are in the South, the sport has a healthy international following. So, read on to learn all about NASCAR betting online. If you're an enthusiast tempted to bet on NASCAR, here's the key information you need to know. Is it legal to bet on NASCAR in the USA? What are NASCAR's betting odds? What is the range of markets? When it comes to betting in the USA, you need to know the legality of doing so. Despite the majority of NASCAR events taking place in the country, it is currently only legal in certain states to wager on this sport. In particular, New Jersey offers legal online sports betting, including NASCAR betting online. The top sportsbooks in New Jersey are definitely SugarHouse and Resorts. If you can't decide between all the available options, we're here to help. Our staff favorite sportsbook is without a doubt SugarHouse. Besides their extensive sports- and racebook, SugarHouse offers a great welcome bonus: 100% match up to $250. SugarHouse, 888 Sport, and Caesars are the largest betting companies that offer consistent markets on NASCAR betting online in NJ. Likewise, they also run specials on larger events, such as the Daytona 500 throughout the season. However, oftentimes wagering is limited to one-off events, like the upcoming Indy 500 in the IndyCar series. When it comes to the best odds, it's a close competition between these sportsbooks. Generally, odds will be very close if not identical, so bet with your personal favorite. As an example, let's take a look at the recent 2019 Daytona 500 odds. 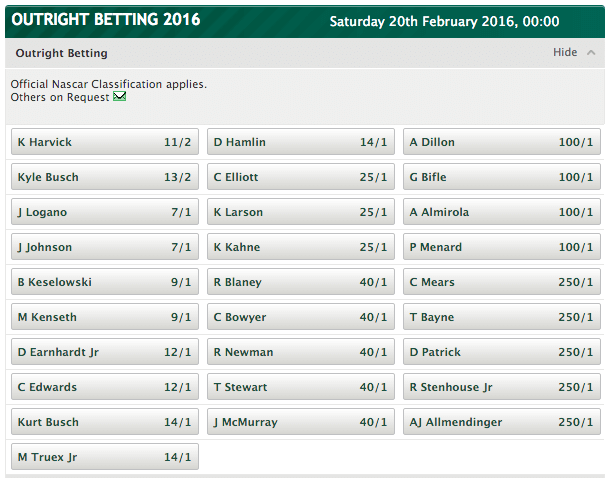 There's clearly a wide range of odds on Daytona 500. NASCAR picks tip: if you want more bang for your buck, check out SugarHouse today. 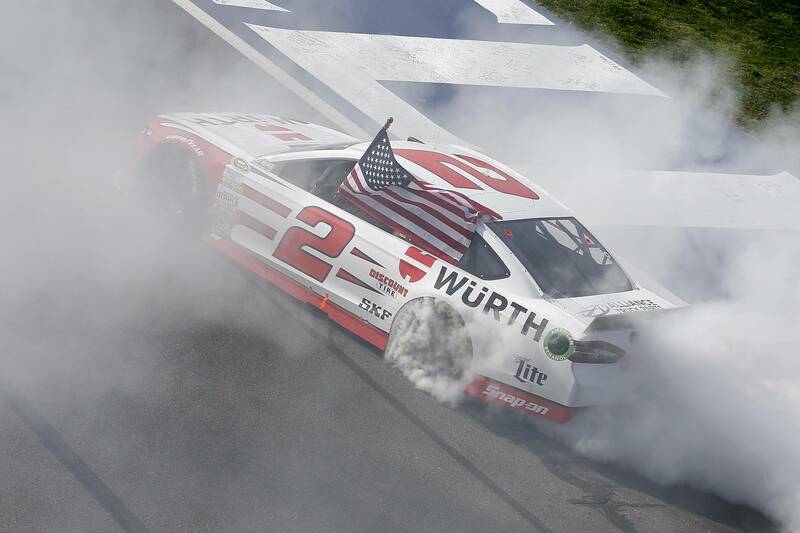 The range of NASCAR markets is largely identical across NJ sportsbooks, however, there are some slight differences that are worth factoring into your betting schedule. SugarHouse: right now, SugarHouse is taking bets on the TicketGuardian 500 as well as the Monster Energy NASCAR Cup. 888 Sport: Like SugarHouse, 888 Sport is taking bets on the same two races. Don't miss out! 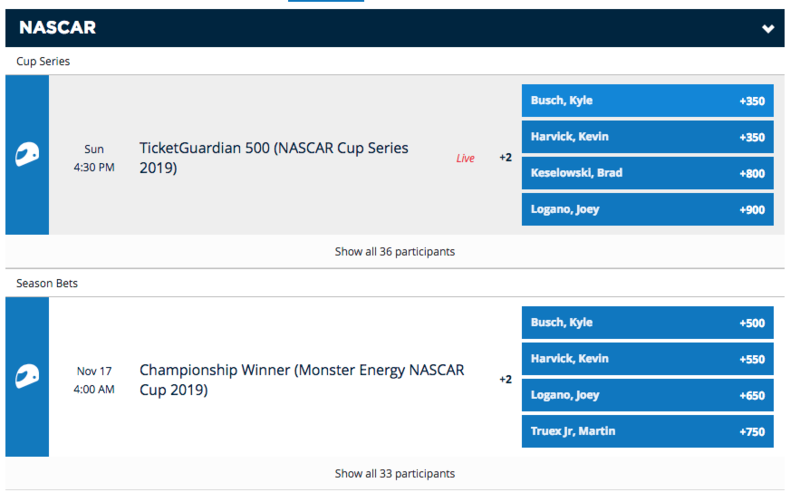 The TicketGuardian 500 is Sunday, March 10, 2019. Caesars: Unlike the other two on this list, Caesars is only taking bets on the Monster Energy NASCAR Cup. The race is November 17, so you have some time. Nonetheless, don't forget to get your bets placed! The most famous race in the Spring Cup is the opening event of the calendar, the Daytona 500. This 500-mile race is held annually at Daytona International Speedway. It is the most important and prestigious event in the sport, which is why many betting sites offer special markets on it. Both SugarHouse and 888 Sport offer great markets on this race. 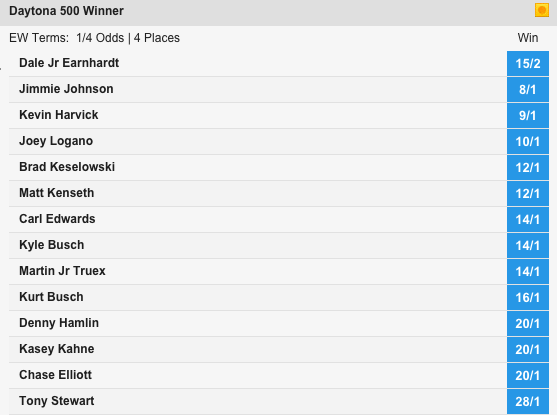 A few years ago, Dale Earnhardt Jr was the NASCAR picks favorite, with a win for him returning over 8-1 stake. Likewise, the 2nd favorite was Jimmie Johnson, again priced the same, at 8-1. However, besides the big names like recently retired superstar Danick Patrick, the differences become more apparent. And, if you're wagering on a lesser-known driver, this is where picking the right sportsbook becomes essential. Below, you can see how the 2016 lineup fared in the 100th running of the Daytona 500. This ought to give you a clear overview of the clear betting points in NASCAR. Let us know how you get on in the comments below!